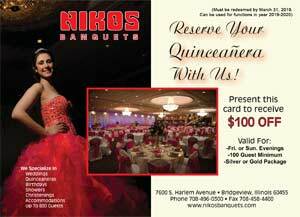 Since 1973 NIKOS has been the icon of distinctive Banquet Dining in Chicago’s southwest suburbs. Our team of dedicated professionals who take pride in total commitment to guest satisfaction will assist you with every details of your event. 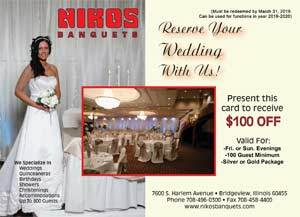 NIKOS is able to manage your needs from decor, security, service and entertainment. Our experienced team can assist you planning a large scale event, with hundreds of guests, to intimate nuptials with close friends and family. Our newly remodeled facility will meet your expectation and keep the tradition of elegance in dining.